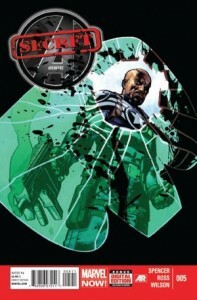 As Secret Avengers #4 ended we were left with the question, what will happen on A.I.M. Island? Issue #5 claims to give us the answer. But in the end like so much of this series, it could all be a lie. Director Johnson has sent Fury, Hawkeye and Black Widow to A.I.M. Island to seek retribution for the Iron Patriot drone army and the death of an American politician. The group was ordered to kill the A.I.M. Scientist Supreme. The reader is left asking if the assassination took place and if so by what S.H.I.E.L.D. agent as Coulson debriefs each one of them individually. While Coulson gathers the facts of what went wrong, he attempts to warn Fury of a leadership shift within S.H.I.E.L.D.. Will this change put the Secret Avengers in hot water for what did or did not happen in the U.N. sovereign A.I.M. Island? There is a lot going on here. And as a reader, I am still not 100% sure what happened. But S.H.I.E.L.D. sure has a formidable opponent in A.I.M. and I want to keep the ball rolling on this not so cold war. And luckily I can see no end in sight, especially when the Scientist Supreme notes the long history between the two agencies. They are chocolate and peanut butter. I cannot tell who is fooling who yet, if it be ally or enemy. We have seen Barton and Romanoff have tension with Coulson, but never Fury. In the debriefing Fury looks uncertain about the intentions of his old friend Cheese. Does Coulson have a secret agenda, especially in light of the leadership change? Is he loyal to his friend, the team, or the agency? I cannot help but think that even with a hidden agenda that Coulson is looking out for his old comrade. We also find out here that there are concerns about Agent Johnston as Director. Yes she was Fury Sr.’s chosen successor, but she is young. And Barton’s best jokes in this issue are at Johnson’s expense as he debates with Romanoff the merits of her youthful leadership. This combined with Hill’s tension with Director Johnson make it clear that only Fury Jr. may be fully accepting Daisy’s leadership. We also get a glimpse into Barton’s psychology. Hawkeye is not a killer. He cannot remember why he is a member of the team, but he does not believe that it is enough to make him a murderer. He is an Avenger! Romanoff, who also cannot remember why she joined the Secret Avengers, believes whatever it is must be enough to make their loyalty to the team secure. And as we observe Barton’s protests that he is not a killer, we ask did he do it? So as the story wraps up you feel like you understand what happened on the island. And then the last page hits and you question everything you think you know. And I cannot help but hear Weird Al Yankovic singing in my head “Everything You Know is Wrong”. Success Secret Avengers, I cannot predict how this story will end, and I really am not rushing to see it end soon! And this shocks me since I was lukewarm to issue #1. Fury, Barton or Romanoff; which one assassinated the Scientist Supreme? Was it any of them? Coulson attempts to get to the bottom of the story of what happened on A.I.M. island. And maybe none of them knows the true story.